Sleep, slumber, shuteye, Zzzs. Call it what you will, just make sure you stay on top of it. How much—and what kind of—sleep you get can affect your appetite, energy, weight, and recovery, not to mention protect against heart disease, diabetes, and cognitive decline. In other words, it’s pretty critical to your health and well-being. That’s why Fitbit is taking sleep tracking to the next level with Sleep Stages and Sleep Insights, two innovative new features that give you access to information previously only accessible in a sleep lab. Everyone’s sleep cycle is different, but by better knowing your sleep quality and patterns, and realizing the impact it has on your day, you can make lifestyle changes—such as diet, exercise, winding down before bed, and keeping a consistent sleep schedule—that can help improve your sleep over time. For more information, check out REM, Light Deep: How Much of Each Stage of Sleep Are You Getting? For this feature, Fitbit uses the whole of your Fitbit data—everything from your diet to your exercise patterns—to discover trends about what may be affecting your sleep and then offer up personalized guidance on how to improve it. Sleep Insights relies heavily on your sleep logs, so the more you wear your tracker to bed, the more personalized insights you may receive. Hopefully, by better understanding your sleep patterns—and what affects them—you’ll be empowered to make lifestyle changes that can help improve your sleep (and overall health and wellbeing) over time. 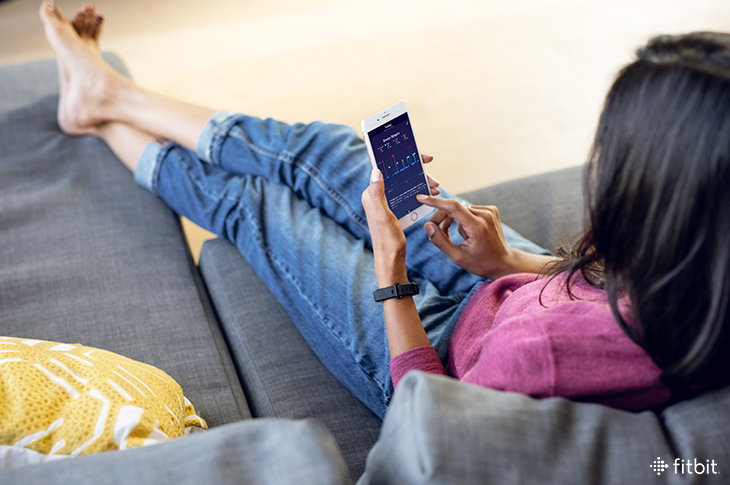 Over the past two years, Fitbit sleep scientists and product teams worked with industry-leading sleep experts from Johns Hopkins University, Stanford University, and the University of Arizona on everything from the design to the development of these features. Sleep Insights was developed by combining the current scientific understanding of sleep with Fitbit data gained from over 3 billion nights of logged sleep. Fitbit’s panel of sleep experts personally validated every insight that will be communicated to you, making sure the information is both applicable and scientifically valid. Sleep Stages is available globally on Fitbit Alta HR, Charge 2, and Blaze. The feature is viewable in the Fitbit app—which is compatible with Android, iOS, and Windows devices—and on your Fitbit.com dashboard. Sleep Insights will be available in the Fitbit app and work with all Fitbit devices except Zip, which does not track sleep. Now if my Charge 2 would only monitor my breathing as to sleep apneas, it would be complete night time sleep tool. Would that be great or what? Will this new facility not be available with the Surge? I thought this was your “flagship” product? Is there a technical reason why Sleep Stages won’t be made available for the Fitbit Surge or Fitbit Charge HR? Yes, I’d also like to know why it can’t/won’t work with my wife’s Charge HR. Is it technical or marketing? Sounds like it will be coming in a future update, I fm reading it correctly. The sleep insights are available for all devices but the zip. However, it appears that the stages will not be available for all devices. If you can’t have the sleep stages now, maybe the Fitbit technology will evolve and come in an update in the near future. What is the reason sleep stages is not available for fitbit surge? Sorry to ask the obvious question, Is this amazing feature backward compatible with my fitbit XYZ. If so, when will it become available on my fitbit XYZ? Not all features are available for surge? When will this be updated to my Fitbit Charge 2???? Mine did the same and I think it seems to show the new data as long as i dont manually begin my sleep log. If I just go to sleep without going in the app then the new data seems to be there in the morning! Mine started sensitive sleep on Apr. 19 and went through Apr. 27.. I’m bummed that it stopped. When I waken I go the the bathroom, remove my fitbit and step into the shower. My charge 2 records this time as awake but logs it in my sleep pattern as awake time. This is so annoying as my percentages are then inaccurate by 20-40 minutes. Sounds picky but as I’ve improved my sleep patterns its so annoying. I just replaced my Alta with a ChargeHR2, comprising a slimmer profile for more in depth tracking and features. And I’m going to miss out on this… because? Kind of annoyed. I think she is confused because she was calling it the Charge HR2 (not on the list and doesn’t seem to exist) when it’s actually the Charge 2. When is this update coming? I have a Charge 2 and the update hasn’t hit my app yet. I just got a Charge 2 on Friday and it’s working for me, although oddly enough it did not show the new detail the first night I had it. It doesn’t appear that the app changed over the weekend and the firmware update was downloaded to the unit when I set it up on Friday. Really looking forward to Sleep Stages and Sleep Insights update. Charge2 is a great Fitbit. I wear mine all day and night and this update will provide me with even more information. Psyched!! Keep steppin’!! I have a charge2, which is great, when are the features coming? I would like to replace my jawbone up3 with the Charge 2 now that REM sleep is available. Wondering who to contact as my sleep tracker quit working last week? why has the graph changes shown up for my Blaze and Charge 2 but they are not recording any information yet? I tried restarting my phone but nothing still. It did update the new abilities but it’s not working on mine. How come sleep insights only worked for me the first couple of days after I updated the app and now they are not working anymore? Is this why the Log/Sleep screens have changed? If so, please change it back. The new system doesn’t log time the same as before. Is it possible to have the old style back if you don’t like the new info? My Fitbit Blaze reverted back to the previous sleep patterns instead of showing REM, last gut, etc. Did something change? Mine just did this too. Did you figure out what happened at all? I really liked the sleep stages information! Any updates on when this new sleep tracking feature will be available on the Charge 2? I keep reading it will be available in April and Engadget said it will roll out with a firmware update. Are firmware updates automatic or is this something I need to watch for and manually do myself? Also, I see people in the new asleep Group saying you have to switch your sleep tracking mode to “sensitive” in order for this new feature to work. Is that true? A little more info on all of this would be great! The new sleep tracking feature worked for a week on my new charge2 and I really liked it, but it reverted back to the previous form last night. Any suggestions? Missing the time information with the new screens. My charge 2 in UK is still not showing sleep stages. Has the roll-out timetable slipped? OK if it has but nice to know. Thankyou. Similar to another post, insight has only worked a couple of times since the update, whys that? This only worked a week on my Fitbit and now it is back to the old version!! Help, I love the new tracking of light, deep, REM. Why did my blaze change back to old sleeping log. I no longer have the new sleep pattern. Does a “smart alarm” will be introduced once for fitbit Charge2 ? This would be a very nice feature. And I think that technically this is no big deal if the tracker already recognize the sleeping phase. Mine just reverted back to the old way? What happened? Could you provide an update regarding why the sleep stages appeared for many of us for three to five nights last week, only to suddenly roll back to the old format without explanation? Will they be brought back? For about 2 weeks the new featured appeared and worked find. As of today, April 5, my Sleep Stages has reverted back to the old method…. what has happened to the new feature? I have the CHARGE 2. I love this feature and it worked great for just over a week but last night’s data is presented in the old format (asleep, restless, awake). Is this a known issue? I use a Blaze. thanks! I’m at present reading this article to find the answer to the same question. The only thing I’ve found is that they are still perfecting the feature and asked that we be patient. Confusing that an update can revert back to a previous feature. Seems like it was on a timer. My daughter has a Charge 2, as do I, hers never had the sensitive sleep feature. Mine worked April 19-27. The update was on April 17. I had this update on my Charge 2 for a few days, and it went away. I like the new sleep tracking, but have two issues with it. It needs to count the number of times awake, not just give you a percentage! Also, would be nice if we could zoom in on the sleep charts more and time at the bottom of charts was shown in half hour increments instead of four hour blocks. I purchased a charge 2 & the sleep patterns worked the first night but has not worked since then. Why would this happen? Just to echo previous comments, I need to know the time I was restless or awake in order to track sleep patterns for apnea. As others have mentioned, this feature was dropped in the latest versions. previous comments: Missing the time information with the new screens. s this why the Log/Sleep screens have changed? If so, please change it back. The new system doesn’t log time the same as before. This would be a great feature if it worked consistently. Unfortunately no matter where on my wrist or how tight/loose I wear it or what position I sleep in, the sleep stages function has only worked twice in almost three weeks of nightly wear. I have a charge 2 and still haven’t received the update for the sleep cycles. I want it. How do I get it ??? everyone else I know with one received the update several weeks ago. My Blaze is updated but sleep phases do no show, just a gray pattern. How is this fixed? It’s really crappy that I spent the money on a surge, but don’t have this feature. My wife’s 69 dollar charge 2 does. Pretty disappointing. Went to bed last night with my Blaze but this morning only had the old data- have the sleep cycles been discontinued? I have brand new Charge 2 and has only ever shown “No Sleep Stages”. Even when I went to help section and it said to tighten it if I wasn’t getting readings. It’s well past March rollout date. Please make this available for the Charge HR. Ok for 15 months I’ve had a Charge and now a Charge 2 – I always sleep with it on. When I check my phone app, my stats for sleep haven’t changed much for all that time, but last week my stats have shown that I am in bed say for 8 hours but it is showing my sleep total to be approx 3 hours or 4 or 5 – and HUGE chunks of LIGHT BLUE which indicates RESTLESS/Awake but there are hardly any lines of RED to indicate AWAKE. It is so strange to me. There seems to be a more coherent chart when I sign on on to fitbit on my computer. I think there may have just been a sleep tracker update? Anyway, I have had some pain in last week – and I wonder if that is what is causing a change in my sleep pattern or if my fitbit is broken or malfunctioning? Is this ridiculous of me to think? Is there a way to post the charts here? I had this data from my Charge2 after yesterday’s sleep – it was brilliant! – but it’s gone from today’s. What happened? Dud the update get reversed? I don’t like the change they made on sleep with the One. Can’t see the sleep % nor does it show the times awake – only a graph mark and you have to guess what time it is. Please change back to the old way or correct this. It is frustrating. The “new app” started 3 days ago and now instead of 7-8 hours of sleep, it shows 3’30” ! When I get up to use the restroom it suddenly thinks I’m up for the day! I am not happy with it at all! Can I have the old sleep app back? Curious as to why I purchased the most expensive, “top of the line” Fitbit if it will not offer the best features? Maybe I read this article incorrectly, will this R.E.M. feature be available for the Surge? My sleep stages stopped showing 2 days ago after showing for a couple of weeks. Will it come back again? Or do I need to do something? Teething problems?? My fit bit charge 2 started showing sleep stages (deep, light, REM) about 2 weeks ago. I really like the feature! This morning my fit bit reverted back to the old app (sleep, restless, awake). How do I get the sleep stage app to work again? Did you get an answer yet Shirley? Why is it that some nights do not show these details? My Fitbit hasn’t upgraded to the new ‘Sleep Stages’ settings yet. It’s not showing any available updates. When will I get this new setting please? Just bought a Fitbit Surge. Will it mointor REM sleep ? Just bought a Fitbit surge. Will it monitor REM sleep. The new Sleep info worked on my Fitbit Charge HR for 10 days. Last night it reverted back to the prior features. I’m sooo disappointed!! What happened? It seems that many people have asked about why this is not available on the Surge, but I cannot see the answer. Will this become available for Surge? Just bought an Alta HR. Sleep stages didn’t work the first night, worked the next three, then haven’t worked the last four. It only tells me when I am asleep or awake and that isn’t even accurate. I was awake for two hours that I know of that it said I was asleep. Did I get a lemon that I need to return? I have a FitBit Charge and I’d like to get daily sleep information about how I sleep but I only get it once a week. How can I get it after each night’s sleep? Can anyone help me? I have a Fitbit Flex 2 and trying to see the data for different stages of sleep, i.e. Light, R.E.M. , awake. All I see on my dashboard is times awake, restless.can you please tell me how I can get the specific graph data so I know when I achieve R.E.M. I am new to Fitbit HR. The display for today’s sleep does not show details like REM sleep, deep sleep, etc. It did yesterday. I’m confused. Also, I had the Fitbit off while I took a shower today and it was logged as sleep and added to my overnight score. Do I need to know something? I am new to Fitbit HR. The sleep data recorded last night was not displayed with REM sleep, deep sleep, light sleep etc, just awake time, restless, etc. Is there something I need to know? Also, I had the Fitbit off while I took a shower today and it was logged as sleep. Love the new sleep tracking with my Charge 2. However, yesterday evening I watched a quirky but not-very-exciting movie (Terry Gilliam’s Zero Theorum) in bed, then got up, brushed teeth, walked the dog and went to bed. Looked at the app before turning off the lights and noticed Fitbit had logged the entire movie as sleep time (mostly light, with a few short spikes of deep early in the film). Interesting. I think that as Fitbit is only improving, this will be resolved soon. It is very interesting, and I think that impressive results will soon show. I need the original style or add how many times a night a night I am restless. This new graph was nice and looks pretty but it really doesn’t explain much. sounds great. can i use this app based on data from my fitbit One? My fitbit charge HR has stopped tracking sleep properly. Was tracking like the picture above, but now has gone to 2 times awake, 12 times restless and 31 min awake/restless in a 9hr 36 min cycle. Although I see the sleep start time is inaccurate starting an hour earlier than when I put my head on the pillow!. My charge 2 won’t show my R.E.M. Sleep ? It’s new- updated my I phone and just synced it. How can I see that R.E.M. Report please? Does anyone know what the faint red lines on the sleep bar graph mean? They are interspersed at the top of the graph. Not like the bolder awake parts. Info on them. Hers has “receive sleep insight” which mine does not. It also shows what type of sleep she had eg. R.E.M., light etc. Why does mine not have these. They are the same versions? In your percentages you use in the article above, do they include the awake-minutes in the denominator? I have an new Blaze. It records sleep and pulse but does not record sleep stages. What do I need to do to get the sleep stags feature? I have yet to see an explanation for the small red tick marks at the top of the graph. Are those also awake times, but shorter than the awake periods that are connected to the rest of the graph? where has my sleep stages data gone. I was getting daily REM, deep sleep, light sleep, awake data, until September 4?? Why did it stop and resort to the generic data report???? I eagerly bought a charge a couple of years ago to accurately track my sleep because of long term depression. Less than 4 months after I did there was an update and it lost this ability forever. I complained, was ignored. I was hoping this news was there were finally announcing the fix to the update. Nope, they just want to fleece me again. I really wish articles like this would be less misleading when they mention diabetes. Sleep is not know to protect against Type 1 diabetes. I imagine you actually mean Type 2 diabetes. This should be made clear, otherwise it’s simply incorrect and misleading. My fitbit alta hr is a very valuable tool to me to track my heart rate as I have atrial fibrillation. The only problem is when my heart is racing at night it thinks I Am awake so not getting reliable sleep data. Any suggestions. Is there any way to know if cpap equipment is needed by looking at ones sleep log? Can you set the alarm to only wake you during a light sleep phase? I have a FitBit HR. The detail sleep patterns stopped working. I have deleted and reconnected my device multiple times and sometimes that works for one or two nights and then back to simplified details. VERY frustrating! Wassup FITBIT IT software engineers??! Have anyone tried the fit bit charge 3? has anyone tried out the new fitbit charge 3 ? I just got a Fitbit Alta HR and thought it would track sleep patterns: light, deep and REM sleep. As of yet, I haven’t been able to locate the data. Do you have any suggestions? I wonder what the results may be. I suffer from nightmares a lot. Maybe, I understand when they appear and why. I do not always remember them, but later in the day suddenly memories and intrusive images come-up in flashes.